For the purpose of providing you with quality services, we require you to register yourself on our Website OR thought Mobile Apps and get yourself registered. If you choose to become a registered member of our Website OR Mobile Apps, you must provide your name, e-mail address, gender, phone number, password Additionally, Livingadda collects your other personal details including but not limited to your Login by third party API, feedback, suggestions,Schedule an Appointment..etc (“Personal Information") and Our Website OR Mobile App does not collect information about you except when you specifically and knowingly to provide it. We do not intentionally gather Personal Data from visitors who are below the age of 18 years. If a user below18 years submits Personal Data to our Website OR through Mobile App and we found that the Personal Data is the information of a user below 18 years, we will delete the information as soon as possible. If required in future we can share this information with third party service providers or third party advertisers for our online advertising and for other purpose, as we may desire. By usage of our Website or Mobile App you expressly permit us to access such information for sending a alert message on mobile and an email. When you post your property details OR your requirement details (text, images, photographs, messages, address,details,Phone No. or any other kind of content that is not your e-mail address) on our website or through Mobile App, the information contained in your posting will be stored in our servers and other users will be able to see it, along with your profile photo and any other information that you choose to make public on your listing page (“Have an Adda OR Need an Adda”). The information that you provide in your Profile will be visible to others, including anonymous visitors to the website or Mobile App. To make our website and Service more useful to you, our servers (which may be hosted by a third party service provider) collect information from you, including your browser type, operating system, Internet Protocol (“IP”) address (a number that is automatically assigned to your computer when you use the Internet, which may vary from session to session), and a date/time for your visit. 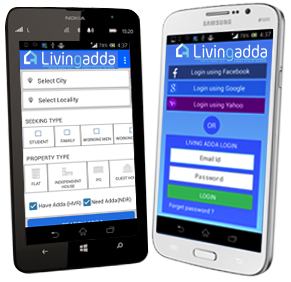 Livingadda makes every reasonable effort to preserve the privacy and confidentiality of your information shared with us. We implement standard measures to protect against unauthorized access to and unlawful interception of Personal Information. However, In internet we can not fully eliminate security risks. We allow you to use your Facebook and Google ID to set up an Account. If you wish to use your Facebook or Google account you are taken to the Facebook or Google website to login to your account and this information is then shared with us for the sole purpose of setting up your Account. We receive testimonials and comments from users who have had any experiences with our Service. We occasionally publish such content. When we publish this content, we may identify our users by their first name , last name ,Company name,Owner or Tenant and may also indicate their serving city. We obtain the user’s consent prior to posting his or her name along with the testimonial. We may post user feedback on the website from time to time. We will share your feedback with your first name , last name ,Company name,Owner or Tenant and serving cities. You may change any of your Personal information in your Account by editing your profile within your Account or by sending an e-mail to us . You may request deletion of your Personal Data by us, and we will use reasonable efforts to honor your request. Livingadda.com respects the privacy of its users and is committed to its protection. You may address any of complaint, grievances and queries to any of the contact details available at our contact us page.